Wastewater treatment plants were not designed to filter medication so any medications flushed down the drain or toilet gets dumped into our waterways. Medication thrown into the trash can also infiltrate our water, as landfills must be drained as their contents decompose. 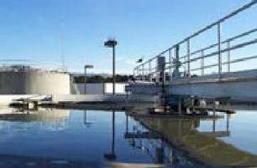 Like sewage, landfill drainage (leachate) is treated and then released in to the waterways. Leachate from the Marquette County Solid Waste Management Authority is released into the Carp River! Leachate treatment systems must meet state and national standards, but are not regulated for the removal of medications. Estrogens can have feminization effects on male fish, causing them to produce eggs. 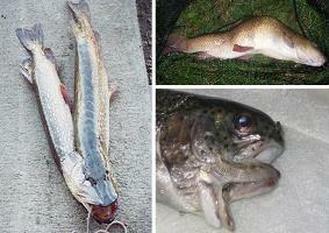 This can disrupt the male to female ratio of fish populations. A study in Boulder Creek, CO found that female white suckers outnumbered males by 5:1 because of abnormal estrogen levels. 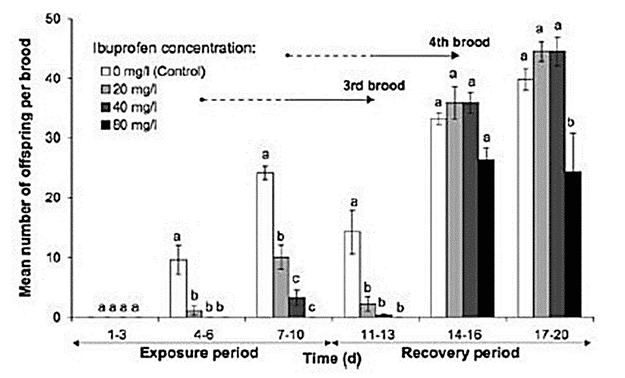 Exposure decreased number of Daphnia magna ( water flea) young produced in 10-day exposure to ibuprofen followed by 10-day recovery period. 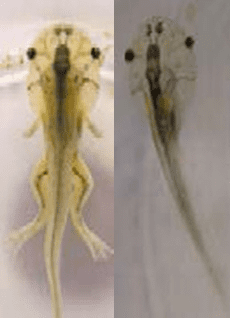 Metamorphosis delays: African frog tadpoles were raised in clean water in tanks of water mixed with 38 ppb fluoxetine. Days after the tadpoles hatched, the control group had begun to develop legs, but the treated tadpoles had none.